Experts say it's likely the two countries will return to "working-level" talks. 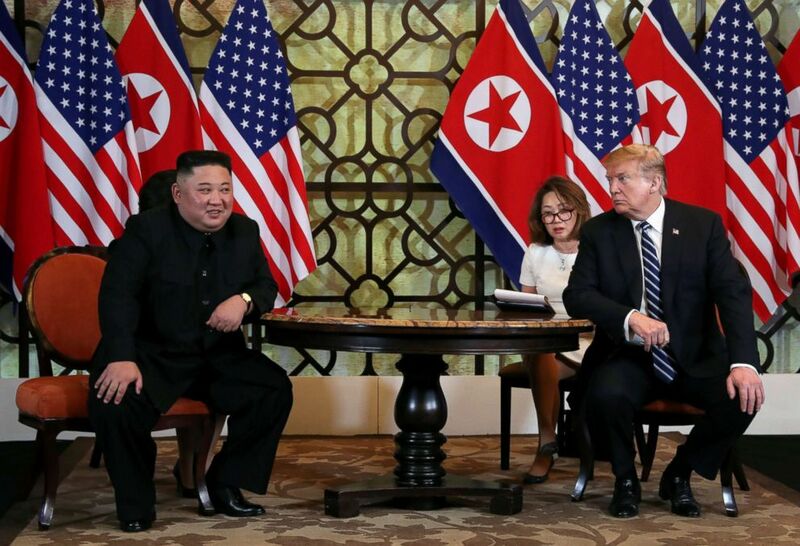 President Donald Trump and North Korean leader Kim Jong Un were not able to come to a formal agreement during their second summit in Hanoi this week. So what happens next? Experts say it's likely the U.S. will return to "working-level" talks with North Korean officials, as countries in the region urge a sustained dialogue between the two countries. During a press conference following the summit on Thursday, Trump told reporters that while he decided not to pursue "some options" that were on the table during talks "it was a very productive two days." "But sometimes you have to walk," Trump said. "And this was just one of those times." The president said that the North Korean side "basically...wanted the sanctions lifted in their entirety," but in a midnight press conference North Korean Foreign Minister Ri Yong Ho disputed that saying Pyongyang was requesting the removal of about half of the United Nations-imposed sanctions, but not all. (KCNA via Reuters) North Korea's leader Kim Jong Un and President Donald Trump speak during the second U.S.-North Korea summit in Hanoi, Vietnam, Feb. 28, 2019. In return, Ri said that North Korea was willing to dismantle its Yongbyon nuclear facility – only one of the sites where the country is capable of producing fissile material, but "the United States insisted that we should take one more step" in addition to Yongbyon. "Therefore, it became crystal clear that the United States was not ready to accept our proposal," he added. Ambassador Robert Gallucci, who negotiated with North Korea in the 1990s for the Clinton administration, thinks a return to discussions between lower-level officials, referred to as "working-level" talks, could work to "bridge this gap" between the two sides. "Can the gap be closed? Well, we won't know until we try," said Gallucci, who is now with the Stimson Center, a nonpartisan international policy think tank. 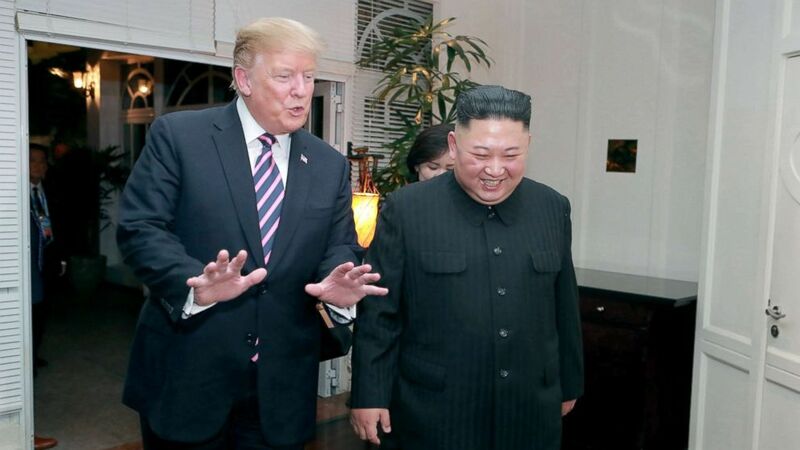 He said the outcome of the Hanoi summit was "potentially perfect" because the U.S. didn't make concessions, yet the discussions revealed what North Korea was willing to give up at this time for sanctions relief. "Yongbyon is clearly on the table, it's just that the price was too high," Gallucci said. (Leah Millis/Reuters) President Donald Trump looks towards North Korean leader Kim Jong Un during the one-on-one bilateral meeting at the second North Korea-U.S. summit in Hanoi, Vietnam, Feb. 28, 2019. "Everyone thought President Trump was going to give away the store, and he didn't," said Joel Wit, the director of the North Korea-focused think tank 38 North. He agreed that working-level talks would be needed to keep making forward progress. But it's unclear how much those talks could really move the needle. “Our principled stand will remain invariable, and our proposal will never be changed, even though the United States proposes negotiation again in the future," Ri said during the press conference in Hanoi. (Evan Vucci/AP) President Donald Trump meets North Korean leader Kim Jong Un, Feb. 28, 2019, in Hanoi, Vietnam. "I feel that [Chairman Kim] may have lost the will for future dealings," top North Korean diplomat, Choe Son Hui, told reporters. One win for Trump? Kim committed to not test missiles and nuclear weapons, the president said. However, this doesn't mean the regime can't produce the material necessary for those weapons in the meantime. "We know exactly what the risks are of them using negotiations to drag out the length of time they have to continue their nuclear, chemical, biological weapons programs and ballistic missiles," Ambassador John Bolton, Trump's national security adviser, told CBS News in July after the first summit in Singapore. Trump has asked South Korean President Moon Jae-in to "perform the role of a mediator" between Washington and Pyongyang, according to a spokesperson for Moon's office. In a statement, Moon's spokesperson called the collapse of this week's summit "regrettable," but that Trump and Kim "have made more meaningful progress than at any time prior." "We hope that the United States and North Korea will continue to have active dialogues on various levels going forward on the basis of the discussion results from this summit," the statement read. Lu Kang, a spokesperson for China's Foreign Ministry, similarly noted that "dialogue and consultation is the only way out." 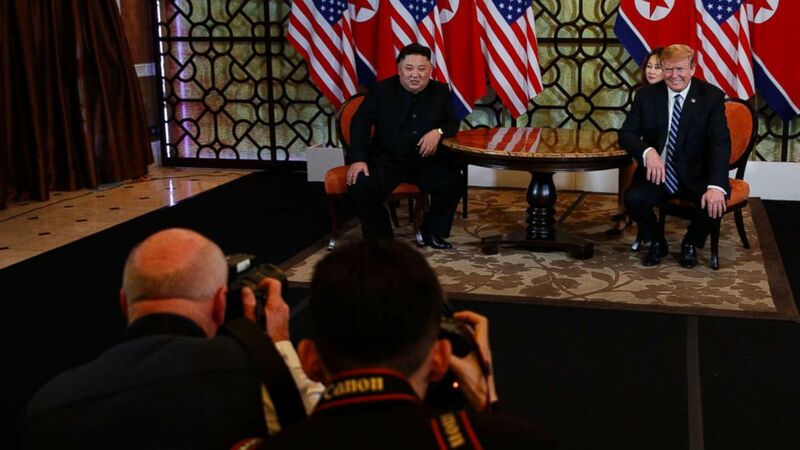 "Therefore, we hope that the DPRK (Democratic People's Republic of Korea) and the United States will continue to maintain dialogue, show sincerity, truly respect and take into account each other's legitimate concerns, and work together to promote the denuclearization of the peninsula and the establishment of a peace mechanism," Kang said. ABC News' Ben Gittleson contributed to this report.